who needs a kitchen island!?! Published on November 8, 2011 November 21, 2011 by cara.b.b. i had lunch with some of my old work buddies in the river market yesterday. it was great to catch up and get the the lowdown on what’s changed since i left the workforce – hello jeans day every day! we went to a great little place called cafe al dente at 4th and delaware (i would like to recommend the offside sandwich – yum!). after lunch, there i found myself in the river market with about an hour before nap time, so the short guy and i walked across the street to peruse one of my favorite antique shops. i’ve talked about it here. 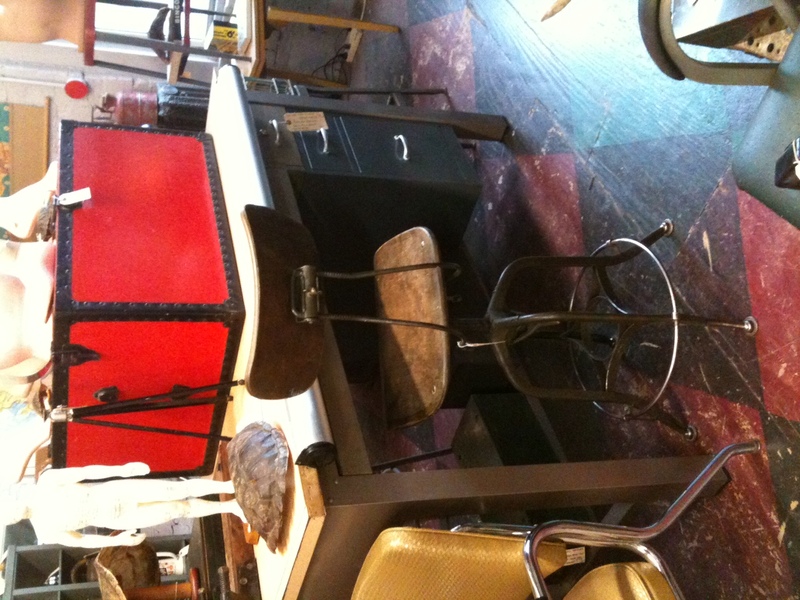 i came across this old school drafting table, and stopped in my tracks. i think it would make a really awesome kitchen island. keep the body just the same for a little industrial vibe, and redo the top with a hunk of butcher block or marble. it would take up all the floor space of our current kitchen, but if it’s still there in a decade when we move, i’m going back for it! i’ll take that stool too!